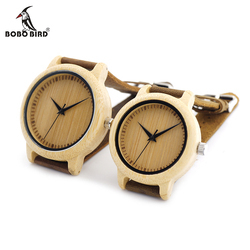 Home › Lover's Watches › BOBO BIRD Lover ..
Bobobird watches are crafted from natural bamboo,wooden and soft genuine leather. It aims at offering you fashionable and comfortable products. Logo customization.If you're interested in that,contact us. Notice:The handmade watches may have some rough lines because of natural materials.